Visiting amusement parks in Georgia takes time and planning. That’s why we put together the most supreme guide to Six Flags Over Georgia that you’ll ever need. Want to know how to beat the line at Batman or one of the other popular roller coasters? When is the best time to hit the water park? We’ll tell you. Where can you snag a discount? Read on for the scoop on this popular Cobb County attraction. Read below for tips to beat the lines, and why you’ll want to consider visiting Six Flags Over Ga. in the fall for Fright Fest or during Six Flags Holiday in the Park. 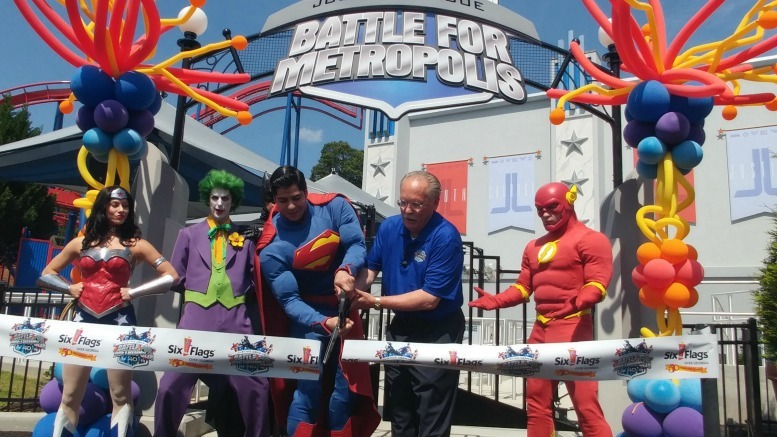 We even have a review of what’s new like the addition of the Justice League Battle for Metropolis (of course you can always go with the classic Dahlonega Mine Train). So grab yourself something to take notes and read on. Every year Six Flags Over Georgia reinvents itself just a little bit. In August the theme park announced they were replacing the Georgia Cyclone with a new hybrid coaster thrill ride called the Twisted Cyclone that promises a classic wooden coaster with a steel track for a smooth experience. The ride is expected to debut Memorial Day Weekend. This ride will load 28 people at a time, 2 across on each train, 2 trains total. In contrast, Goliath loads 36 people at a time, 4 across, 2 trains. This means that the line will grow for Twisted Cyclone faster than for Goliath, so keep that in mind when considering how you plan to plan your park visit. Also for 2018, the classic wooden roller coaster the Great American Scream Machine will make it’s famous drops, twists and turns backwards. Justice League, Battle for Metropolis was introduced for the summer of 2017. It’s a dark ride that I’m still mentioning because it’s the best new addition to Six Flags since Hurricane Harbor. If you haven’t been to Six Flags recently, make sure you do this ride. I love amusement parks, but I hate long lines and throngs of people. If you’re like me, then here are some tips to get the most from your visit to Six Flags Over Georgia them park. This is true for ANY of the theme parks in Georgia or pretty much anywhere. Most people run late, so although they may try to get to the park when it opens, fewer people do. Add in time to park and walk to the entrance and you’ll find that the crowds are lightest at opening. Remember, you want to be ready to walk into the park at opening, which means your Six Flags Over Georgia tickets have been purchased, bathroom breaks are finished and sunscreen is on. At Six Flags you can pay a premium to park near the entrance ($25+), but if you’re looking for bargain parking ($15), you’ll have to walk a bit, so figure time in for parking and walking to the entrance. We found a bargain parking lot on our last visit by going right instead of left toward the park. The Six Flags address is 275 Riverside Parkway Southwest, Austell, GA 30168, if you need to get directions. Six Flags phone number is (770) 739-3400, just in case. Be there 30 minutes before opening for no-line roller coaster rides. The operator I talked to mentioned that often the park will open the main gate 30 minutes prior to the scheduled opening of the park. It helps to thin the crowds at the gate. So look up when does Six Flags open on the day you’d like to visit, then be there 30 minutes before that. Generally, they’ll have the Georgia Cyclone (this roller coaster will return in 2018 as the new and improved Twisted Cyclone) and Georgia Scorcher open early as well. This is a great time to hit these rides and likely ride again and again. During our latest visit, this tip rang true, so get there before opening for no-line roller coaster rides. Head to the Back of the Park. Most people meander to the right when they tour an amusement park. Those in the know may head straight to the large roller coasters like Goliath. Those with the inside scoop on Six Flags Over Georgia rides head to the back of the park and work their way to the front. If you like trills, that means go directly to Metropolis Park. If you’re a roller coaster fan, go to Batman first. Why? Because Batman is more popular than Superman. Why Batman instead of Goliath? Because Goliath is a high capacity ride that is much easier to load than Batman, or Superman. Plus it has a bigger loading station, more seats, and a longer ride, so it gives the ride operators more time to load and unload. Batman’s station is smaller by design, you’re made to feel like you are in the bat cave. When you finish Batman, go quickly to Superman and Justice League: Battle for Metropolis. These two rides are very popular too and are located right next to each other. Because Goliath loads faster, you can save this one later. If you follow these two suggestion, you’ll have covered three of the 11 roller coasters (probably multiple times) within the first half hour of the park opening! Mid-week is the least crowded time to visit Six Flags Ga. If you must come on the weekend, Sunday is a better day than Saturday. Lines will thin out after dinner. From dinner time until closing the lines should be much shorter. However, if you want to see the shows, check the Six Flags schedule, often times the shows don’t run in the evenings. Visit Water Rides in the Morning. Thunder River has a long line in the afternoon once folks get hot and are looking to cool off. Visit Thunder River in the morning and you’ll avoid the longest lines. Hurricane Harbor, SixFlags Over Georgia’s Water Park has a similar traffic pattern. Folks generally wait until the afternoon to get wet, so visiting the wave pool or your favorite water ride in the morning is a best bet. The best way to avoid lines is to map out the day prior to your visit, here’s a Six Flags Over Georgia Park Map. Know before you get off one ride, where you’re going next. Like many theme parks, Six Flags also has an app with ride wait times, show schedules and restaurant menus. It’s free to download for both iPhone and android. Be sure to download and review BEFORE you head to the park so you don’t spend precious time trying to figure out the app. Get a Six Flags schedule before heading out and determine what shows you want to see and when. Inside venues are great for mid-day when it’s hot and you need a break. To avoid long lines at the concessions, and to enjoy the shorter lunch time ride lines, plan to eat a bit early or late. Either eat no later than 11:30 or after 2 pm. You’ll skip the food lines and enjoy slightly shorter ride lines during peak dining hours. If you are a season ticket holder, you may want to consider purchasing a dining plan. If you want to save a little money, bring a picnic. Six Flags does not allow coolers, but you can exit the park (make sure to get a hand stamp for re-entry), have a healthy lunch and return. Good Eats. Daddy O’s BBQ was a favorite of several folks surveyed. Daddy O’s is located near the Dare Devil Dive rollercoaster. The Lickskillet Section of the park is food court type set up. If you have lots of different tastes, this may be the best place for variety. Six Flags does boast healthy options, but I’m a bit skeptical on how healthy you can really make chicken fingers and how lasagna and brownies can be gluten free. For a more traditional healthy option, try the grilled chicken Cobb salad at JB’s Sports Bar & Grille or substitute fries for a fresh fruit cup at Dee Jay’s Diner. Before paying full price for Six Flags Over Ga. tickets, check for discounts. Here are a few we’ve found. Buy tickets online at least one day before your visit for the best prices, and so you can skip the ticket lines and go directly into the park. AAA members receive a discount when they show their card at the ticket booth. A Six Flags military discount is offered at most military bases. Often you can find discounts on locally purchased Coca-Cola cans. If you plan to visit more than twice, consider a Six Flags Over Georgia Season Pass. Although not a discount, you can get more for your money on the games in the midway if you know which one to play. For instance, the water race games like Top Glo, there is a winner every time you play. At Rising Water and Spyromania, kids get a hat just for playing, and every player wins something at Piedmont Scale or Lick Scale. And if your kiddos under 42 inches want to play Balloon Dart, they’ll let them keep shooting until they pop a balloon and win! 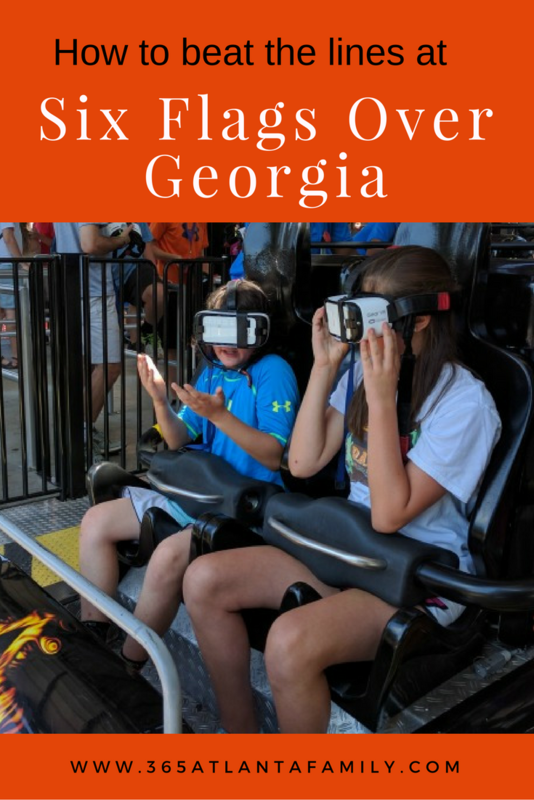 Most people think about Six Flags Over Ga as a summertime adventure, but off season is a perfect time to visit for shorter lines and special seasonal fun. Here’s what you need to know about Six Flags Fright Fest and the Six Flags Christmas celebration called Holiday in the Park Six Flags. Be sure to consult the Six Flags calendar before heading out. Six Flags Over Ga. hours are different for the seasonal events than the regular six flags hours during the summer. All in all, we found fall a great time to visit 6 Flags Over Georgia. For one, it’s not so hot. For another, there is Fright Fest. Six Flags Over Georgia Hours for Fright Fest: The Six Flags Halloween celebration during the day is perfect for young children, but after 4 pm, many of the areas of the park are not recommended for children under 12. We have an entire post on Six Flags Over Georgia Fright Fest, but here are a few quick tips. Not so Scary Activities include Free Candy. Free candy is always a plus, I mean isn’t that why we trick or treat? We scored a few treats while running from ride-to-ride in Bugs Bunny Boomtown from some very friendly pirates. Inside the Bugs Bunny World Theater, there are even kid friendly spooky stories being told. Fright Fest Extras: Fright Fest is included as part of the normal Six Flags Over Georgia tickets. However, you need to purchase a Haunted Attractions Wristband to get into the six mazes/haunted houses. Six Flags Over Georgia Season pass holders also need to purchase the Haunted Attractions Pass to get into the haunted houses/mazes. Here are the Six Flags Fright Fest Ticket options. Photo by Six Flags, Atlanta Ga. The holiday season is one of my favorite times to visit 6 Flags. For one thing, it’s a heck of a lot cooler. That said, you may want to head to the rides early in the evening, so when the sun goes down and the temperature dips even more, you aren’t screaming through the chilly wind upside down and sideways on a roller coaster. Save the later evening for enjoying a hot chocolate and walking around the park to enjoy the more than one million LED lights, or take in a show in the warm Crystal Pistol theatre. Here are seven more reasons we enjoy Holiday in the Park at Six Flags Over Georgia. Lights. Lights and more Lights. While there are millions of LED lights around the Six Flags theme park to create a festive atmosphere, my favorite is the light tunnel that glistens and dances to the music. Meet Santa Claus. Of course a Six Flags Christmas wouldn’t be complete without Santa. Young kids will love taking the train ride to get to the North Pole. Holiday Shows. My favorite are the carolers, but Six Flags has several holiday shows with lots of singing and dancing to get you in the spirit. Six Flags Rides. The one-horse open sleigh is replaced by a multi-car roller coaster. My kids’ favorite is Goliath. Best part, with the smaller winter time crowds, we were able to ride again, and again. Holiday Treats. Christmas means sweets. At Six Flags Holiday Park, there are lots of seasonal treats. In fact they have two themed areas dedicated to favorite holiday treats. Peppermint Plaza is a sensory experience with the sights, and smells of the season. S’more Village has fire pits to toast your own. Beer. This would be my husband’s favorite part. Seasonal beers at JB’s Sports Bar and Grill, plus the latest game on the screen. He’s not much of a spinner. 7 Comments on "Six Flags Over Georgia: Beat the Lines, Discounts & More [Video]"
Question that you may know the answer to, if you happen to get this in time. Is Mother’s Day a good day to go Six Flags over GA? We’re season pass holders and want to go in order to try the VR Drop before it goes away, and maybe get a preview of the Justice League ride, but not sure if Mother’s Day is usually lighter or heavier bc of the Holiday. Suggestions? Thanks!!! This article was great! Dean, To be honest, I don’t know for sure if Mother’s Day is a good day. My guess is it would be. Sunday’s are generally the lighter of the two weekend days, and if you get to the park early like we suggest in the tips, you’ll miss a good bit of any crowd that is there. Are they previewing Justice League for passholders? I believe it doesn’t open until May 26, so you may want to be sure you can ride if that is a main reason for going. You’ll love it – great addition. Thanks for reading. Have fun. This Mother’s Day 2017 was awful it was bring a friend free for season pass holders and it was packed we left early because of the crowds. So check season passes to see if there are any bring a friend free days and avoid them. Above it mentions bargain parking for $15, but doesn’t tell how to get it. How do you get it, where is it? We found a bargain parking lot on our last visit by going right instead of left toward the park. There isn’t a whole lot around Six Flags but you might want to try that. As I recall, it was near (not at) the gas station, which is right there when you turn. How are single-rider lines at the park? From the map, it seems that they have 10 rides with a single-rider option (great! ), but are they run well? Trying to decide if I should get a flashpass or rely on single-rider instead. Thanks! Hi Gavin, I have not used the flashpass. The times we’ve been there I don’t think it’s an issue – especially if you are willing to do single-rider (although we have never run into lines that long, but we try to go on off days/times). I think a lot depends on the day you go, weather/time etc. I believe you CAN upgrade at the park, so maybe plan to do that if you feel you need it.